Pushkar is a small town set on the banks of the holy Pushkar Lake, for a devout Hindu Pushkar is a very important pilgrim centre, for one visit to this holy place in a lifetime is highly prescribed. 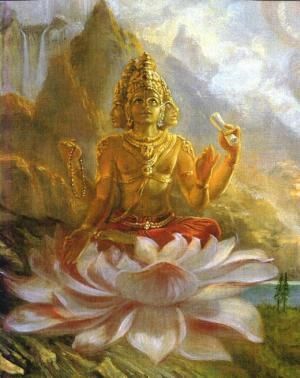 Brahma forms the great Hindu trilogy of Brahma, Vishnu and Shiva, each symbolising the lifecycle of birth, preservation and destruction. Brahma the creator is depicted as of four bearded heads and four hands each holding a book of Vedas (knowledge). And not just Hindus, it is visited by numerous foreigners, all keen on getting a taste of the legends that surround this place. 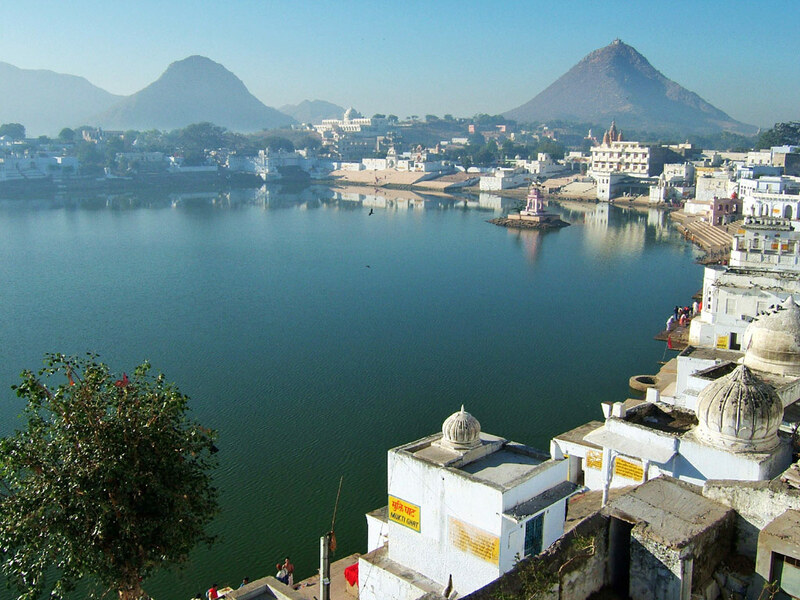 Visiting it is an enthralling experience – along its numerous ghats with quaint names Varaha and Gau, as continuous chants of Om, priests performing elaborate aartis, sadhus in constant meditation, pigeons flocking to the ghats, the changing hues of the Pushkar Lake… This is where you’ll get your share of spiritual experience. According to the legend Pushkar means a pond created by flower, was formed when Brahma dropped a lotus flower on the earth to determine a place for his yagna, a holy sacrifice. The story goes that Brahma wanted to perform the yagna at the most auspicious time but his consort Savitri whose presence at the yagna was vital for its performance kept him waiting. Irritated by this Brahma married Gayatri, a milkmaid and installed her instead. Savitri on seeing someone else in her place was infuriated and cursed Brahma that he would be forgotten by people on earth and never worshiped. She relented on pleas from other Gods that he could only be worshiped in Pushkar, hence there are no Brahma Temples elsewhere. Brahma Temple: Located 5 kms from the Brahma Ghat, this is the only temple dedicated to the Creator Brahma. 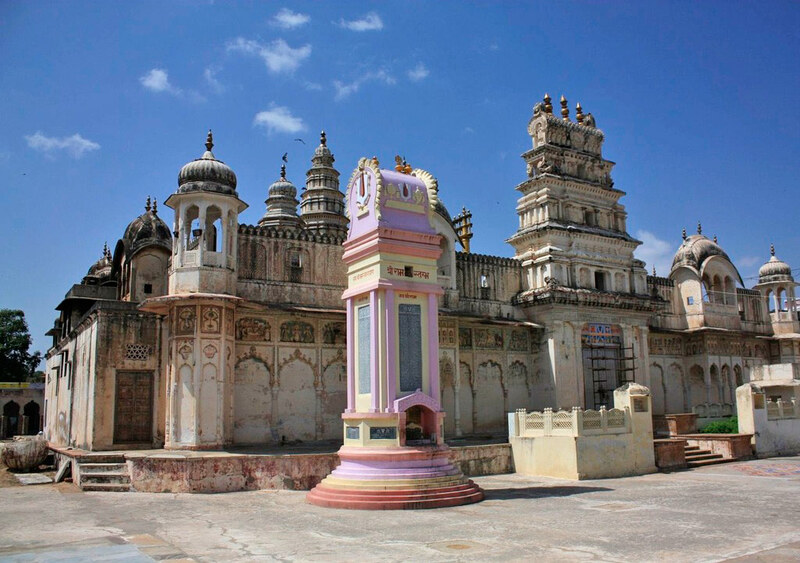 The temple is built in typical Rajasthani style, and extensive use of marble is visible on the external complex. However, the older sanctum within is constructed in stone, though this is concealed within bright paints. 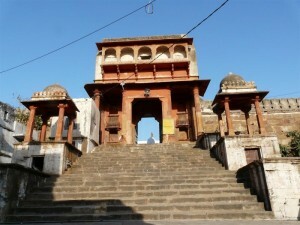 The entrance is flanked by four pillars, domed ceilings and shikara over the sanctum. 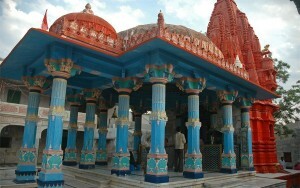 The pillars in the temple are painted in blue, while the dome and shikara are done in bright orange. The marble that has been used in its construction were donated from across the country, from as close as Ajmer to as far as Nepal! The entrance has silver coins coated in it, and this is a feature typicl to most temples in Pushkar. Within the sanctum in the four-faced idol of Lord Brahma with his shy bride Gayatri to his left. Facing the sanctum is a silver turtle, Brahma’s pet. Varaha Temple: Located close to the Varaha Ghat, the temple is crafted in red stones and has an elaborate entrance, reachable by 30 steps. The temple does not have too many visitors and the spacious courtyard remains empty most of the time. Of the several chhatris, only one remains, colored in dull maroon, yellow and blue. If you wish to make an offering to the white marble idol of Vishnu, rice, cooked or raw is what you should give. Charbhujanath Temple : dedicated to the four-armed manifestation of Lord Krishna, the patron goddess of the Rathores, former rulers of Merta. This 400-year temple was the site of poems and bhajans recited by Meera Bai for the Lord. Apart from a statue of the Lord, there is a life-size image of Meera Bai, with the walls adorned with paintings from her life. The temple is the site of the Meera Mahotsav held annually in July. Cultural Activities: An interesting feature of the hotels in Pushkar is the absence of televisions! But considering the options you have, it’s highly unlikely that you’d get bored. There are regular yoga sessions that take place at the ghats. Enroll yourself in one! 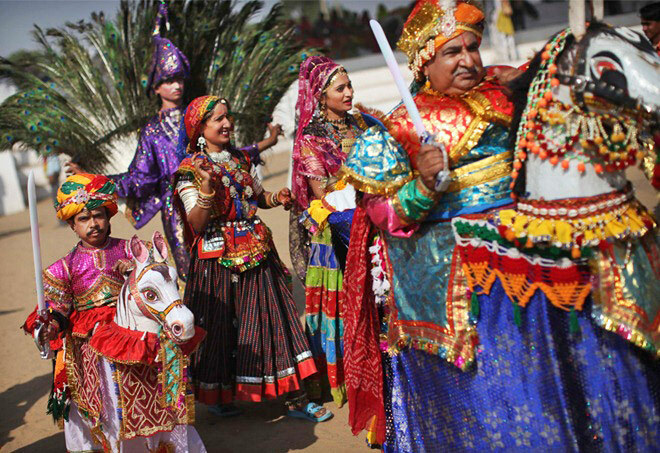 Enjoy some classical vocal and instrumental music at Badi Basti or watch the Lohan and Gujjar folk dances that take place at several corners of the city. An interesting activity you can indulge in is the camel safari that can be arranged by the hotels or cafes lining the lake. Plan an entire package, complete with camel ride, dinner with bonfire and even Rajasthani folk performances. The Pushkar Bagh set at outskirt of Holy place Pushkar. The Pushkar Bagh offering a rare opportunity to enjoy rajasthan’s culture, custom & tradition .The entire Bagh is carved out of the famous pink sandstone of Jodhpur it exquisitely captures the romance and grace of a bygone era. The Pushkar Bagh courtyards are peaceful heavens where guests can unwind for the day and spend the afternoon leisurely reading or relaxing while capturing the panoramic view of mountains and desert. Pushkar Fair : is held in the month of Kartik that usually falls in October or November. 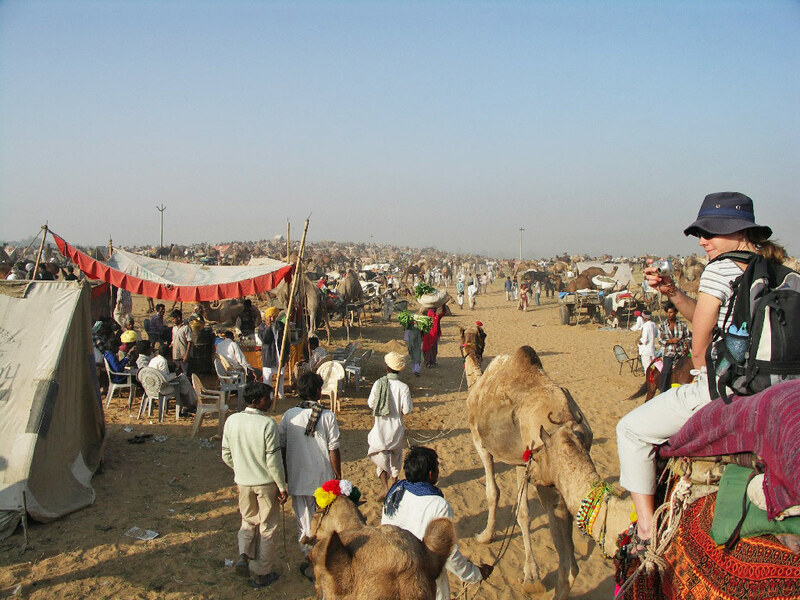 One of the most sought-after fair in Rajasthan, a lot of tourists come to Pushkar Fair on pilgrimage as well as to see the display of a mystifying array of items. With the picturesque sand dunes as its backdrop, the camel fair and camel, horse and donkey races are the featured events of the fair. People indulge themselves in body tattooing as the villagers from distant places come here to trade their wares. The fair is a gala occasion full of music and dance, fun and frolic, echoing songs in the desert land and colorful costumes of the performers. There is a tourist village designed to complement the natural beauty of the site, arranged in blocks of tents that have unique identity and are named after the famous Rajasthani dances. The Camel & Horse races, parades and other cultural events are organized, which are full of fun and gaiety. After an eventful day, as the sun sets down, the entire atmosphere reverberates with the ringing bells and prayers in the temples. At night, hundreds of small oil lamps are lit and placed on green leaves and floated on the lake after the Arti Puja (prayers). the act of worship is called ‘deepdan’, and the entire lake is illuminated. The view is simply mesmerizing and is to be seen to be believed. For shoppers, Pushkar has everything and is particularly well known for silver, jewellery, embroidery and wall hangings, all originating from the tribal regions of Rajasthan. However, being such a large tourist trap, your best bargaining skills will be required against the hard-nosed vendors. Pushkar’s narrow main bazaar is lined with an assortment of absorbing little shops. Here you’ll come across everything from late’60s-timewarp clothing to Rajasthani turbans, from statues of Ganesh to the novels of Salman Rushdie. Particularly good buys include costume jewellery, glass lamps, embroidered fabrics such as wall hangings and shoulder bags, Rajasthani puppets and traditional music. Much of the stock comes from the Barmer district south of Jaisalmer and other tribal areas of Rajasthan. You’ll have to haggle, as Pushkar has long been exposed to tourists with money to burn and little time to burn it. There’s the usual nonsense about ‘last price’ quotes that aren’t negotiable take your time and visit a few shops. What to Eat at Pushkar? Although with an array of restaurants, the lakeside and rooftop views are sometimes more of a spectacle than the food. Be prepared for a strict vegetarian diet, including no meat, eggs or booze. Nevertheless, Pushkar is home to some imaginative chefs and “Hello to the Queen”, a dessert made up of ice cream, banana crumble and cashew nuts, topped with chocolate sauce. The food at Pushkar was perfect for the western taste…not too spicy but very traditional. Malai Kofta, Paneer Bhurji, Vegetable Raita, Missi Roti are some of the choices. By Air: Jaipur is the nearest airport to Pushkar, which in turn has daily flights to and from Delhi and Mumbai. It is also well connected with Udaipur, Jodhpur, Jaisalmer, Ahmedabad, Aurangabad and Calcutta. The airport is not more than 20 km from the city centre. By Train: The nearest railway station to Pushkar is Ajmer. Ajmer has a good network of trains that connect it to Delhi, Jaipur, Jodhpur, Ahmedabad, Mumbai and other major cities of the country. You can catch Shatabdi Express from New Delhi for Ajmer. 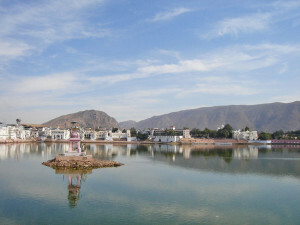 By Road: Pushkar is well linked to Ajmer by roads, which in turn is connected to the major cities of Rajasthan, Delhi and Mumbai.